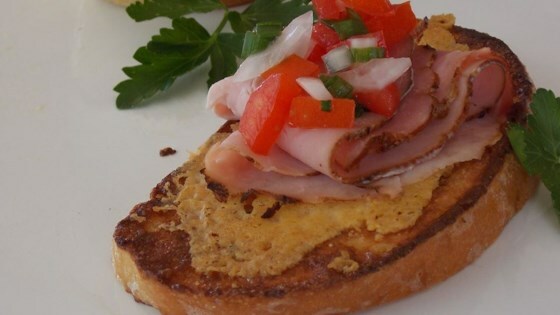 "This savory French toast recipe is a great breakfast or lunch. Served with ham and tomato chutney, these chive spiced baguette slices are fried until crispy and golden, and sure to be a hit." In a shallow bowl, whisk together the eggs, milk, Swiss cheese and chives. Melt the butter in a large skillet over medium heat. Dip slices of bread into the egg mixture, then place them in the skillet. Cook for 3 to 5 minutes per side, or until golden and crispy. Serve with sliced ham and tomato chutney. See how to make wonderfully light and fluffy French toast. This was tasty, but a little on the greasy side. We used a mini baguette and served them bite-sized. Try making Your french toast into French grilled cheese.